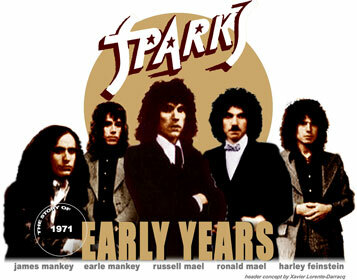 Ron Mael & Russell Mael first formed Sparks under the name of Halfnelson, way back in 1969. Halfnelson (sometimes spelled Half Nelson) is a term for a certain wrestling hold. Pacific Palisades, Los Angeles, California was the place. Halfnelson was a trio, including friend and electro-whizz Earle Mankey on guitar. Russell Mael was finishing high school, while Ron Mael was entering college and becoming involved with Cinema and graphic design. The Maels met Earle Mankey by an ad in which Earle Mankey had advertised for a recording studio and when they came over there. Earle Mankey also convinced the Maels to hire him as a guitar player at $ 2.50 an hour. Apart from being a guitarist, he was a wizard of sound effects and has a degree in engineering from UCLA. Ron Mael, Russell Mael and Earle Mankey were a perfect combination. Ron Mael, who was also quite active as a composer in these days supplied the perfect melodies and lyrics for Earle Mankey to put into weird arrangements and several over-dubs, speed-up guitars and more refreshing recording gimmicks. 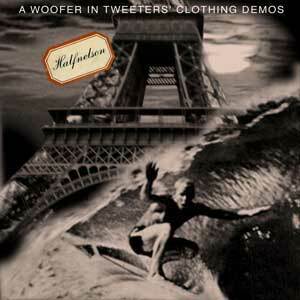 Ron Mael, Russ Mael and Earle Mankey made dozens of home recordings during the late sixties and the most famous one was this famous Halfnelson's "A Woofer In Tweeter's Clothing" demo (not to be confused with the second official Sparks' Bearsville album). Halfnelson decided that a demo album should be professionaly recorded and for that reason, the band badly needed a rhythm section. A drummer was found in the person of rock-critic John Mendelsohn and a bass player was added, named Surly Ralph Oswald. It is however, very likely that this bass player was found after the recordings for this demo had already begun and that most of the bass lines were actually played by Russell Mael, who, even nowadays claims that he started off as a bass player. Ron Mael's use of organ as a key instrument was much more prominent. Earle Mankey played guitar while John Mendelsohn was the drummer. The Halfnelson's demo Lp consisted of twelve songs, all written by the Maels. There were two songs on this demo, which were early versions of songs : "Roger" and "Saccharin And The War", both penned by Russell Mael. The original Bearsville biography spoke of two others songs that were recorded by the band but which cannot be found on the original Halfnelson demo album, unless the titles have been changed. For one, that's very likely as where Bearsville was mentioning a song called "Do The Factory", there actually is a song on the demo called "The Factory". Another song, "Spider Run" was probably never released. Ron Mael designed a sleeve for the Lp, depicting someone flying pass the Eiffel Tower on a surfboard in front of a bright moon. The Halfnelson Lp cover shown above is an artist interpretation of Ron Mael's design by Xavier Lorente-Darracq. The demo version of the album was packaged in a large rectangular box resembling a restaurant checkbook. A hand-written bill for $100,000 For One Halfnelson Album was scrawled on the checkbook. Inside were photos, a bio, and the vinyl disc. Russell Mael : "We always subscribed to the theory that the packaging was an essential part of ones presentation, even at this stage when we didnt know what the hell we were doing". At the time, Halfnelson's main inspirations were English, or English-sounding bands of the mid-60's like The Kinks with Ray Davies, The Move, John's Children, The Who, Tomorrow and Pink Floyd, sounds that are easily traceable on Halfnelson's official first album. 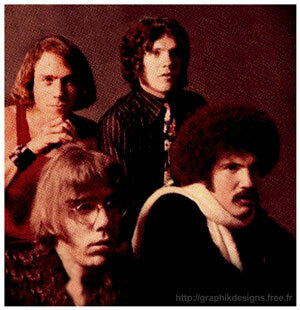 Russell Mael : "We thought Halfnelson was like a British band. I liked British bands and I kind of admired Mick Jagger from the Rolling Stones and Ron's earliest listening influences were The Kinks, The Move and above all the early Who..."
However, the songs recorded for the demo album clearly indicated that the Maels had not listened to the above-mentioned bands only. Music much closer to them, both geographically and culturally, had influenced them much more than they'd probably care to realise themselves : Traces of The Doors, The Mamas & The Papas, Strawberry Alarm Clock, The Beach Boys, Nazz, Franck Zappa & The Mothers, Captain Beefheart and even Jimi Hendrix could easily be found on the twelve songs that were recorded for "A Woofer In Tweeter's Clothing" demo. After the recording of Halfnelson's demo Lp, drummer John Mendelsohn was kicked out of Halfnelson and band's manager Mike Berns took the place. Mike Berns (who looked like a very cool Charles Manson) could play the drums however he had a more relaxed/folksy style than Halfnelson required and so he was terminated as drummer after a brief amount of time. Few months later Harley Feinstein joined the band and Earle's brother Jim Mankey replaced Surly Ralph Oswald. Mendelsohn and Oswald later formed Christopher Milk. Then Earle Mankey got out his tape recorder, and in his living room, Ron Mael, Russell Mael and him recorded four new songs : "Wonder Girl", "Fa La Fa Lee", "Slow Boat" and "High C". Band's manager Mike Berns invested cash and paid the costs for production of the new demo which was sent to Todd Rundgren (ex-Nazz) when he was still Runt. Todd Rundgren the ace producer at Bearsville Records and hot from making his own albums of eccentric, eclectic pop, was immediately drawn to Halfnelson's wayward approach to song construction and odd Europhile appearance. Rumour is, that about one hundred copies of the demo were hand pressed onto vinyl (financed by the band and manager Mike Berns ?) and the album was sent out to record companies. None of them reacted positively. Later this demo album turned up on a scarce bootleg called "California Folk Songs"... It is still not quite clear how the recordings of this album turned up all of a sudden but it was suggested recently, that they were taken from the original acetate. In 1997, Ruud Swart from The Netherlands was given the opportunity to get a copy of the album on cd. The person who gave it to him described it as "exactly the music that you should expect from an album recorded before the Halfnelson album." It actually does sound exactly the way you would have expected it to sound, only better. All songs written by Ron Mael and Russell Mael and sung by Russell Mael except "Big Rock Candy Mountain" sung by Earle Mankey. The demo Lp was produced by Earle Mankey for Halfnelson. Unknown original cover design by Ronald Mael. At time of these sessions, Halfnelson's members was as follows : Russell Mael, vocals and bass guitar, Ron Mael, keyboards, Earle Mankey, guitar, John Mendelsohn, drums and Surly Ralph Oswald, bass guitar.